Play high-quality audio with the F&D F-203G 2.1 Speaker System that comes in a set of one 4-inches Bass Driver Subwoofer and two 2.5-inches Full-Range Driver Satellite Speakers. 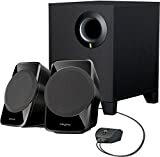 This Speaker System plays your movies, videos, audios, games and more with enriched bass and powerful sound. Furthermore, its wide compatibility support lets you enjoy music with various devices such as DVD or MP3 Player, PC, TV and more. The F&D 2.1 Speaker System features whopping 1500w PMPO (Peak Music Power Output) so that extremely influential sound fills your space. For those who like to thrill with soaring volume, the Speaker Set is thus an ideal choice. Audio quality further gets enhanced by its wooden cabinet that checks unwieldy distortions. Moreover, the QQ shaping of the Satellite Speakers is also a performance-oriented designing aspect. F&D F-203G 2.1 Speaker System has an elegant black exterior. Further, its Satellite Speakers fascinate you with the glisten of their texture. With a bass controller and an indicator for LED power, you bring home convenience along with this Speaker Set. Even lifting these Satellite Speakers is easy owing to the QQ structure. Carry the light 2.1 kg F&D Speaker System when going outdoors for musical ventures and see its potential. Get into the higher league of home entertainment experience with this 2.1 speaker system. Designed for those who like their music and sound loud.